Continuing the spirit of a revolution..
A NATION’S future and its ability to compete in the global market depend greatly onhow it generates new ideas and innovates in science and technology. Keltron hasinitiated steps to create a Knowledge Centre that would catalyse the process ofknowledge assimilation as well its dispensation. 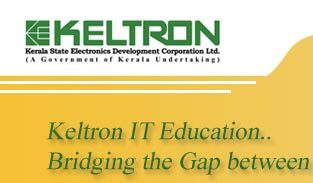 1.Keltron Knowledge Services include three vital focus areas:Knowledge Capital Development: To build and enhance skills and develop human resources capital in the burgeoning technology space. Technical skills in areas such as networking, database management, embedded systems, mobile technology, advanced web technologies, multimedia & animation techniques, Medical Transcription, Call Center and Tool Design & Die Making; management skills relevant totechnology driven enterprises; and, soft skills for the development of the individual. 2. Knowledge Management services: To be a part of the Knowledge Networkproposed by the National Knowledge Commission for the acquisition and dispensation of knowledge across the country. 3. Research and Development Centre: To create a state-of-the-art Research and Development Centre that would facilitate widening the horizon for innovation and technology. The long-term objective is to optimally foster greater global competitiveness for Indianindustry as well as to ensure faster innovation, wealth creation and overall development. Innovation is a process to achieve measurable value enhancement in any commercialactivity, through introduction of new or improved goods, services, operational andorganizational processes. It is a significant factor in facilitating competitiveness,improvement in market share and quality as well as reduction in costs. Keltron plans toset up a full fledged research and development centre focusing on innovation as thekey result area. •Manufacturing capability: Four fully equipped production facilities of over 500000sq.ft.area. •Customer Support Centers in all the Districts of Kerala State and also in eight metropolitan cities of the country : Mumbai, Delhi, Chennai, Kolkata, Bangalore , Hyderabad, Ahmedabad and Thiruvananthapuram.